Dylan and Rachel booked me for their wedding photography at West Manor Estate last fall. They had amazing chemistry (which Rachel tried to deny for years, ha!) and I had SO much fun photographing them together! After any couple books with me, I send a Getting To Know You form so I can, well, get to know them better. :) Rachel and Dylan did such a great job telling the story of how they met and how Dylan proposed that I thought it would be best to simply share their words with you! Aren't they adorable? Rachel: My sophomore year at Liberty University, Dylan happened to be "the sound guy" on the same theater production as one of my best friends. I remember meeting him for the first time and wasn't exactly swept off my feet by his bravado. Rachel: Our little band of friends grew increasingly close, spending countless hours together getting into mischief, studying, going on trips, getting snowed in, pranking each other, hosting holiday celebrations and movie nights, and generally having a great time. Dylan made it clear pretty quickly that he was interested in being more than friends and I made it pretty clear that I was not. Dylan: Over the next two years I continued to take every opportunity possible to spend time with Rachel and get to know her better. Through that time, we grew closer, I matured greatly, and she began to have feelings (even though at the time she denied it with everything in her). Dylan: After two years in the friend zone, I finally convinced her to let me take her on a date. Dylan here. On May 22nd I got up at 3:30 in the morning to get on a plane from Houston, Texas. Rachel was unaware that I was coming to Virginia and I wanted to keep it a surprise. The first leg of my flight went smoothly, however, the second leg was delayed an hour and began to throw off my entire plan. Now rewind a few weeks, I had been talking to Mary, Rachel's sister and Maid-of-honor, about how to make this plan work. What was supposed to happen was that Mary, conveniently home for the weekend from her summer internship in Haiti, was supposed to ask Rachel to go to lunch at the same pizza place where Rachel and I went on our first date. Ally, one of Rachel's best friends and roommate, would plan to join them, but "be running behind" and therefore cause Rachel and Mary to have to improvise and waste some time by walking around the gorgeous college right across the road. Unbeknownst to Rachel, what was actually happening was that Ally was picking me up from the airport and driving me to Randolph College, where I would then propose where Rachel and I had spent hours walking and talking on our first date. However, with my plane having been delayed an hour, Ally and I were pressed for time and had to rush out of the airport. I changed in the airport bathroom, consequently dropping my wallet into the freshly used toilet. In her haste, Ally sped through downtown and was promptly pulled over by Lynchburg's finest with no time to spare as we knew Rachel and Mary weren't far behind. Throwing a coat over me to hide me from view, Ally flashed the ring and explained our urgency. The officer kindly gave her a warning and wished me luck. We pulled away at brisk legal speed and made it into Randolph College just in the knick of time. Once arrived, I discovered that the bench I had planned to propose on was no longer there. Once again, improvisation was necessary. Fortunately, Randolph College does not have a shortage of beautiful locations and we quickly found a nearby, gorgeous, brick gazebo to plant ourselves and, for the first time that day, wait. The rest, as they say, is history. I asked, and she said YES! Oh my goodness, HOW CUTE ARE THEY?! I am so excited to share their stunning fall wedding with you soon! 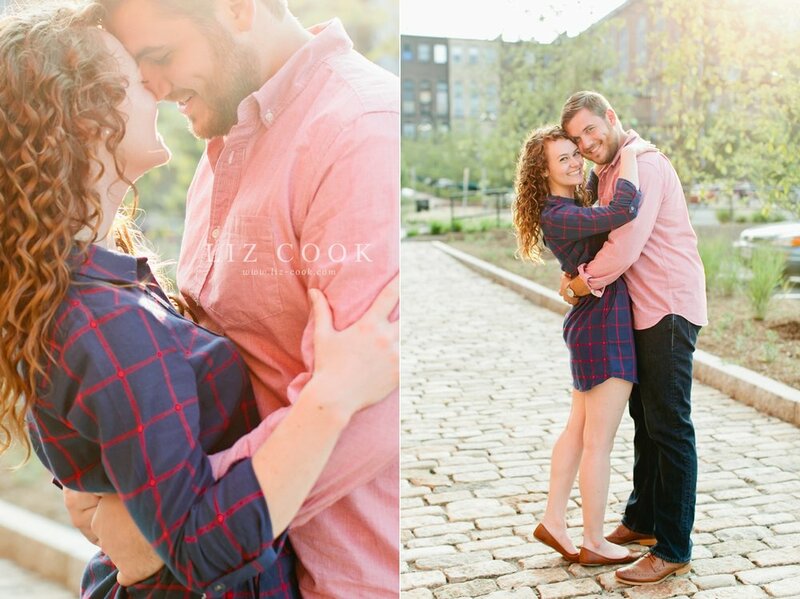 For now, enjoy my favorites from their engagement session below! Are you recently engaged? 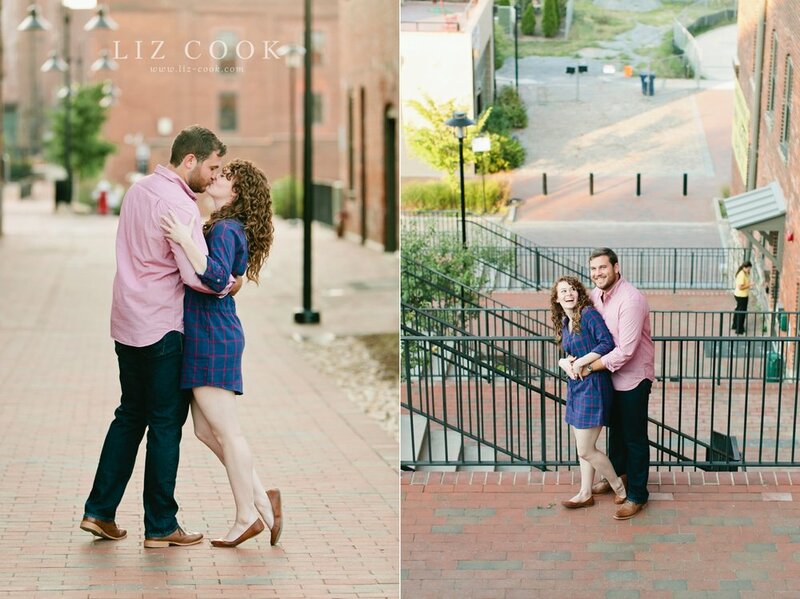 Engagement sessions are reserved for clients who book the full wedding experience with Liz Cook Photography. I am fully booked for the 2017 wedding season and am currently booking for 2018 weddings. It is best to book your wedding photography as soon as possible, as dates fill up quickly. Every Liz Cook Photography wedding photography package includes a complimentary engagement session, full day photography coverage, and the best 500+ high-resolution images from your wedding day. For more information, see the wedding page. If you would like to meet in person, contact me today to schedule a no-obligation, in-person consultation at my studio in Forest, VA (or online over Google Hangout).